This post finally brings my Hong Kong series to a close! Here’s a mishmash of all my other favourite food things I ate and came across while on holiday. 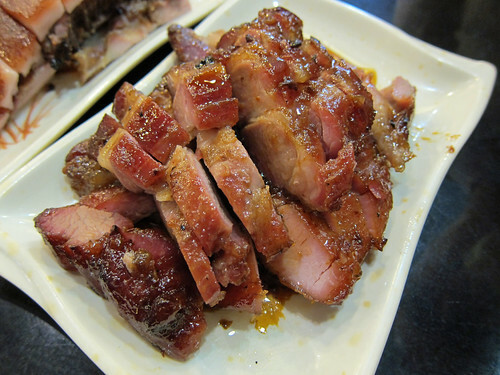 My first night in Hong Kong and M and S took me to a Sichuan barbecue place near their flat. It was a great start to the trip with our ordering a huge spread of lots of barbecued goodies – most topped with lots of chilli powder and a few grilled with garlic butter and cheese. 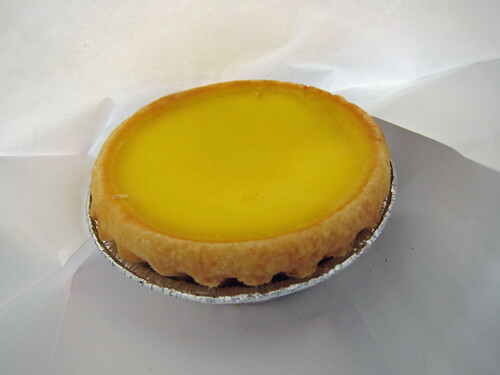 The egg tarts (dan tat) at Tai Cheong Bakery in Central are famous and rightly so. I loved the shortcrust pastry and rich, eggy filling. Not something I tried but look! 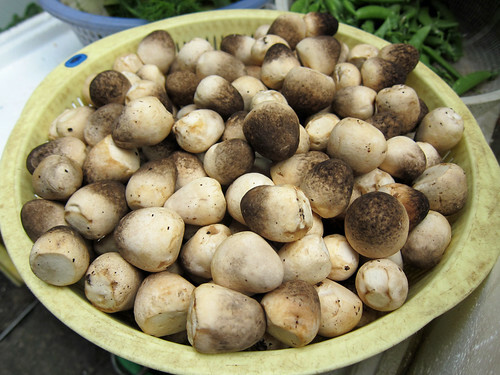 Fresh straw mushrooms! I’d only ever seen them canned. 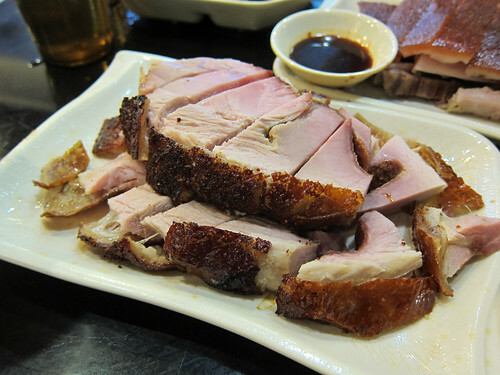 … and finally, a lean yet tender siu yoke (roast pork) with excellent crackling. Reviews do seem to indicate that Hay Hay Kitchen can be a bit inconsistent but luckily for us, it was all good that day. 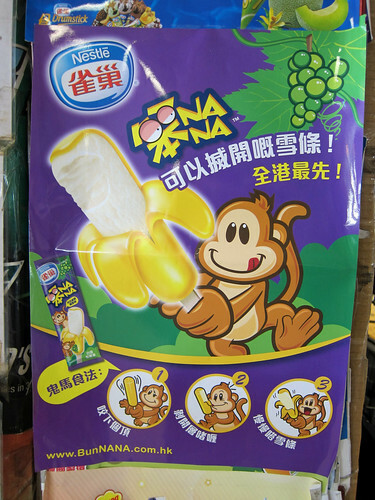 Again, not something I ate but I saw this ad for a banana ice cream that had a jelly skin that you could peel! 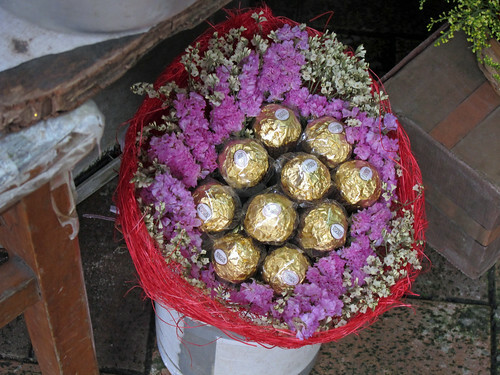 This was seen at the flower market in Mongkok – a Ferrero Rocher bouquet. I wouldn’t mind receiving one of these. One lazy night, we headed to the closeby shopping mall, Elements at Kowloon, and queued at Dondonya for a table at this Japanese restaurant. 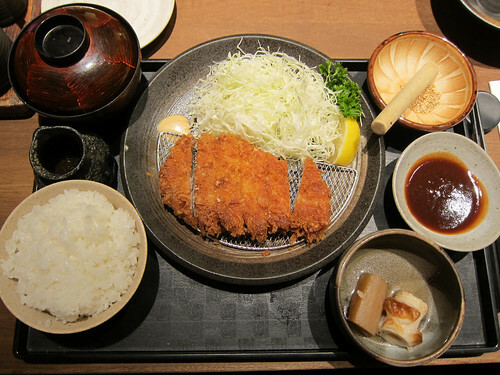 My tonkatsu set dinner really hit the spot that night – how can I say no to a crispy pork cutlet? Westfield, I’m looking at you. You need restaurants like this. Finally, this was at a dessert shop in Tin Hau called Auntie Sweet, recommended to me by a former colleague. My Ah Wong Mango Iced Rice Ball was a bowlful of mango puree, chunks of mango, chunks of nata de coco and these sticky rice dumplings filled with mango, all topped with pomelo bits. It was mango madness. Seriously though, why didn’t I go to Hong Kong before this?! What a fabulous city for eating and I can’t recommend it more. All of my Hong Kong photos (that’s the rest of the food and all the other things I saw) can be found in this Flickr photoset. 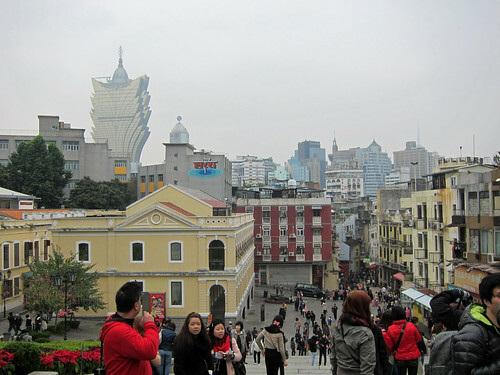 With just over a week in Hong Kong, we decided that I had time to spend a day in Macau, the former longtime Portuguese colony just an hour away. I fell pretty hard for this island, with its mixture of old Portuguese-style architecture, Chinese buildings and modern flashy casinos. What a mix it is and it describes today’s Macau perfectly. 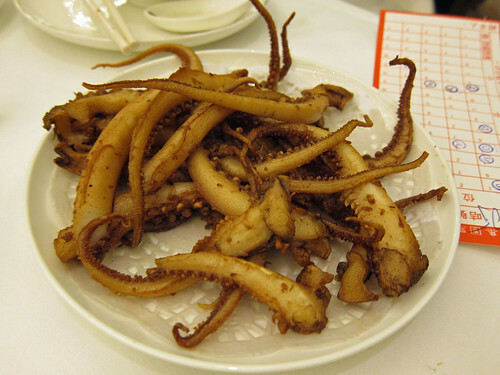 That fusion of Portugal and China can also be seen in the local food culture. 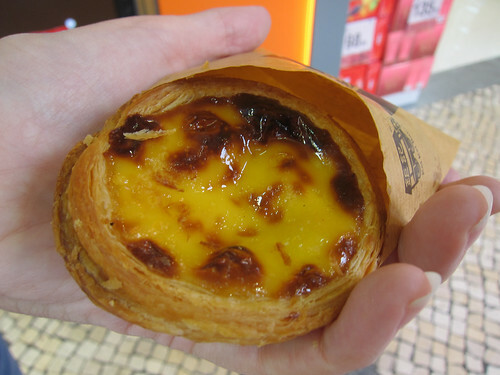 From the ferry port, we headed straight to the old town, bypassing all the casinos and their artificiality, and first stopped at Koi Kee bakery for a Macanese egg tart. 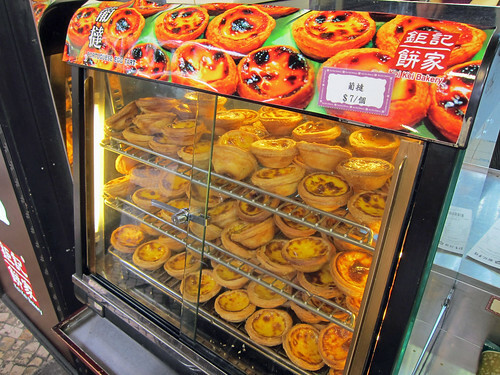 The Portuguese influence is pretty obvious here; the tarts resemble the famous Portuguese ones from Lisbon. They’re just as delicious though the pastry was more like puff pastry over the crispier layered pastry favoured by the Portuguese. 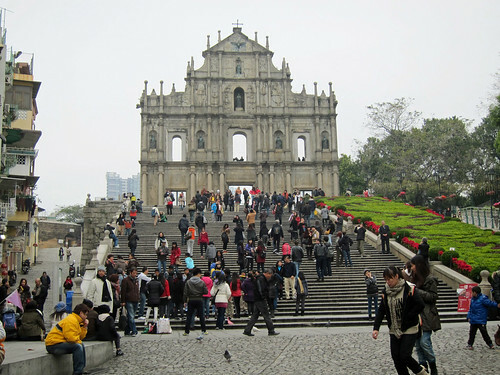 If you’re in Macau, the Ruins of St Paul’s are highly likely to be on your list of places to see as it was for me. 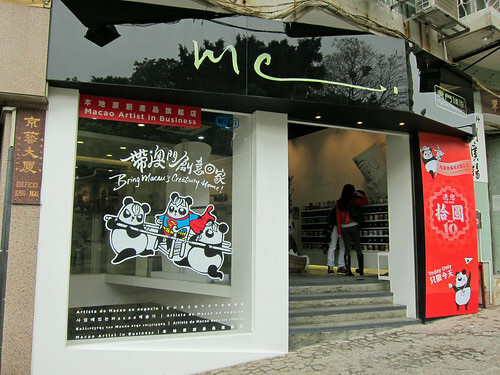 Next to the ruins is a fantastic little gift shop called Macau Creations where all the goods are designed by artists from Macau. I’m glad we stopped in here as a very kind girl working there took a look at the name of a cafe we were hoping to visit in the afternoon on Taipa and told us that it had closed. Gasp! Where were we going to go for the best pork chop bun?! She had the answer. Cafe Tai Lei Loi Kei was originally on Taipa Island but had closed recently and relocated just down the street from Macau Creations. It’s no longer a cafe but a little takeaway hole-in-the-wall. 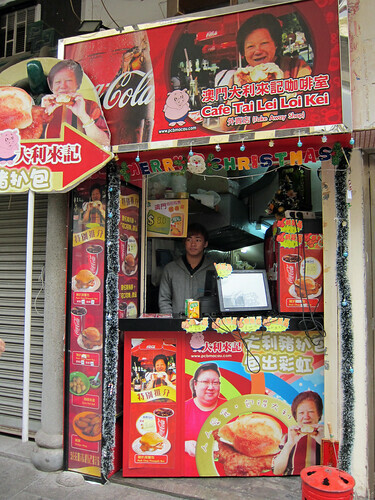 And this is what they’re famous for – their pork chop buns. 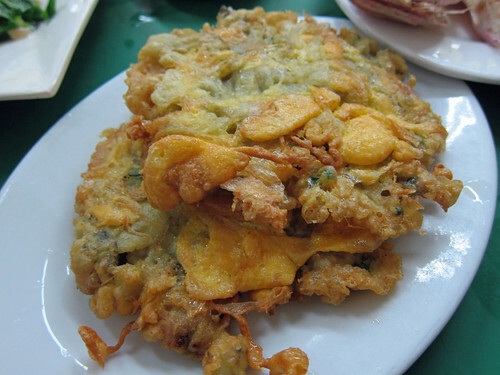 Again, this is quite the Macanese speciality – there is something similar in Portuguese cuisine but the flavours are a bit different. 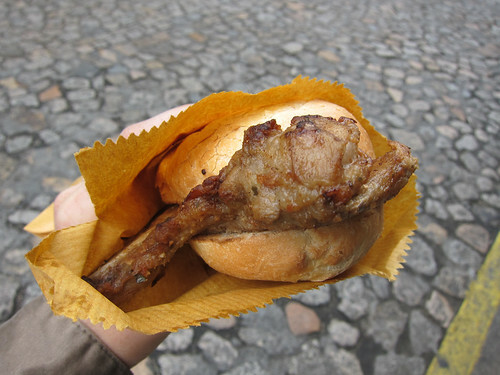 The chop had been marinated and fried and stuffed in a classic Portuguese bun. It’s simple yet so ridiculously tasty. After a wander around the quieter streets with our pork chop buns, we descended back down the busy snack street from the ruins. I can’t remember the name of the street but you really can’t miss it: it’s lined with shops selling Macanese pastries, biscuits, pork chop buns, grilled meat jerkies. There were lots of vendors pushing samples on us and I found myself filling up on them! 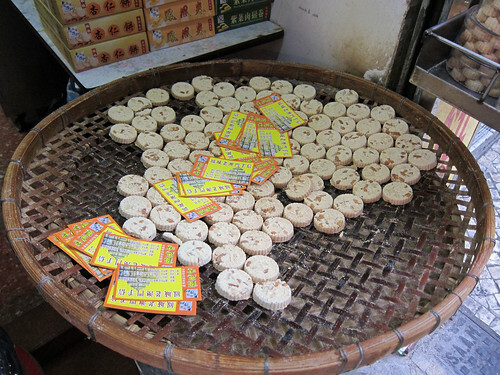 These almond biscuits are particularly famous in Macau but I found them a bit too dry for my liking. The meat jerkies though were delicious but I didn’t buy any. I did leave Macau with a bag of peanut and black sesame cookies though. 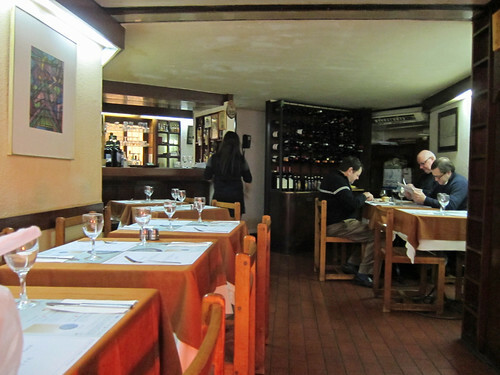 For lunch, we headed to a restaurant recommended by my guidebook, a little out of the way place called Afonso III. 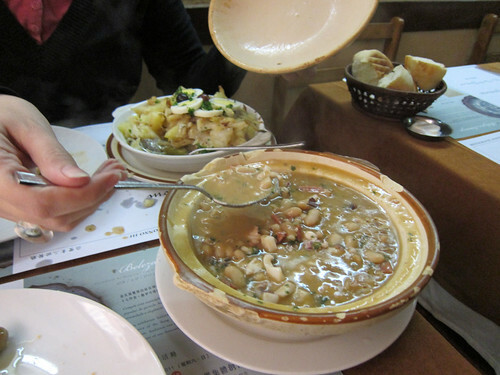 While the cuisine was defined as Macanese, we found it leaning more towards Portuguese and the restaurant itself could have been anywhere in Portugal. 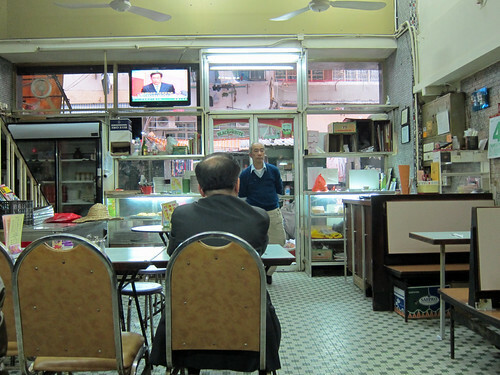 The place was served by the grumpiest Macanese woman but she softened a bit when we thanked her in Portuguese. 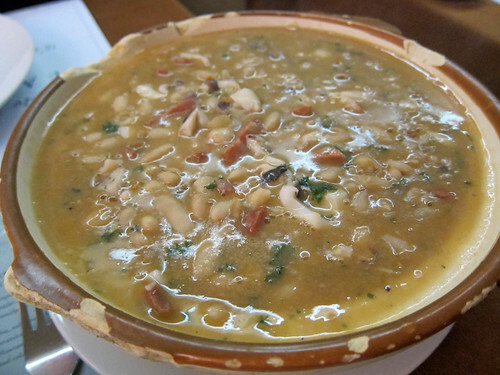 A cuttlefish and white bean stew arrived in a Chinese clay pot and was absolutely delicious. The bread basket came in handy to sop up all the gravy. M fell utterly in love with this stew as it reminded her of one from her childhood. 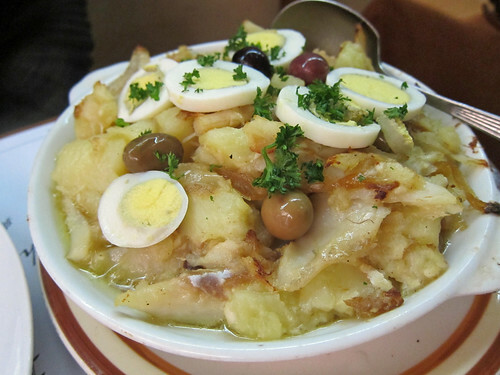 Bacalhau (salt cod) is regarded as particularly Macanese and we also ordered a bacalhau baked with potatoes and plenty of garlic. It was slicked with plenty of delicious garlicky olive oil and piled high with salty cod and tender potatoes. After a whole week of Chinese food, I missed this kind of Mediterranean food! The portions were humongous and M brought all the leftovers home, cooing over them and spending the rest of the day sniffing the bag in which they were carried. 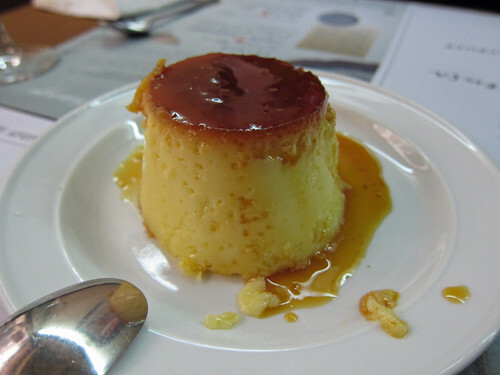 We finished the meal with a flan – it was a bit stiff and eggy but still alright. Still, despite the grumpy waitress and the too stiff flan, I loved the place and felt quite at home there. Prices seemed a little stiff to begin with but turned out to be alright when we discovered that each dish could serve three. We continued our walk around the old town and stumbled upon Rua da Felicidade (a former red light district) without actually aiming for it. 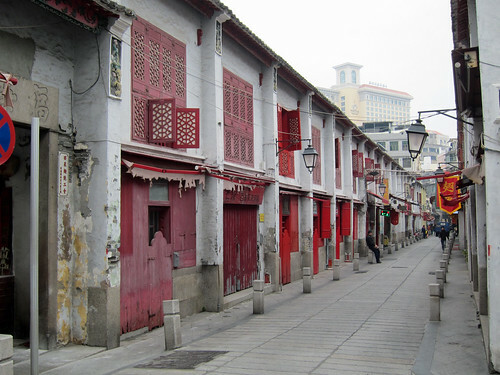 There were lots of shops and restaurants within the row of buildings that I’d love to explore more if I ever get back to Macau. 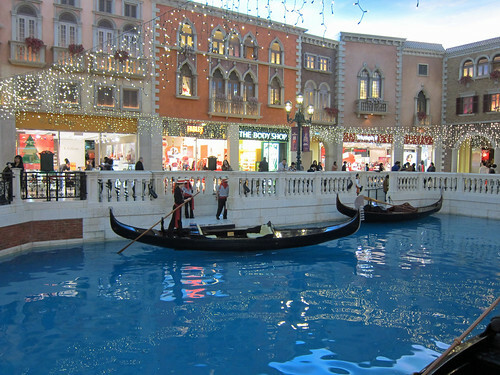 I couldn’t leave without actually attempting to gamble at one of those fancy new casinos but we both failed pretty miserably at the Venetian on Taipa Island (um…there were an awful lot of buttons on the slot machines…). Still, we had a good gawp at the “open air” replicas of St Mark’s Square and the canals. The free casino bus was caught back to the ferry port and we slept all the way back to Hong Kong – it had been a fine day in Macau! I definitely recommend heading over there if you have the chance; I’d skip the casinos and focus on the old Portuguese-Chinese fusion evident in the architecture and food. 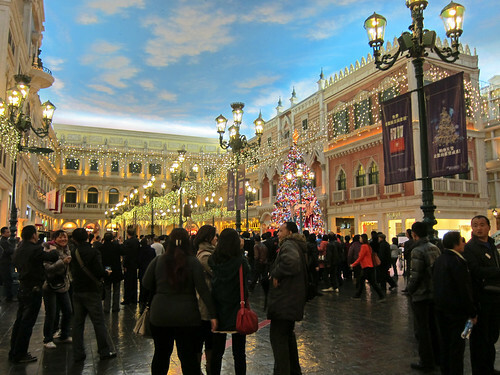 All my photos from Macau can be found in this Flickr photoset. 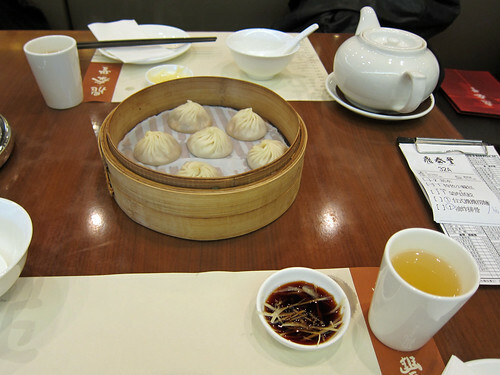 When considering the Shanghainese soup dumplings – xiao long bao – inevitably, the name Din Tai Fung comes up. There are branches of this Taiwanese-based restaurant all over the world but somehow I’d still not managed to visit even though I could have in the past few years. We stopped in to the branch in Hong Kong’s Causeway Bay for a late lunch one day for me to have this rectified. Again, coming outside the regular mealtimes paid off and there were no queues. From their long menu, we only ordered a small selection of their most famous dishes. Their pork xiao long bao must be one of their most popular items and an order of six came flying to our table shortly after we ordered. Instructions were provided at the table if you’re not sure how to tackle one – be careful not to burn yourself on the soup inside! 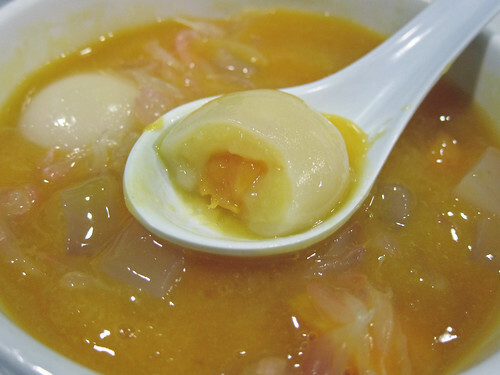 That sweet, meaty broth didn’t leak from any of the beautifully pleated, thin-skinned pork dumplings and they were a pleasure to eat with a dab of ginger and vinegar. 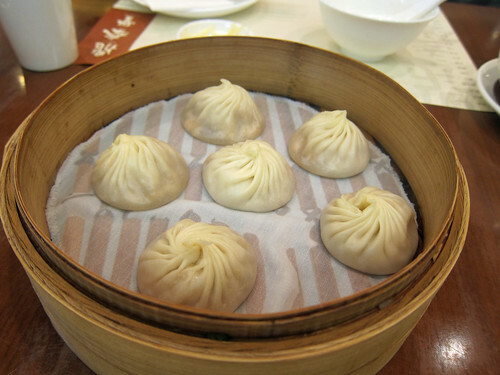 I’ve not had xiao long bao in London that came anywhere near these. The green vegetable and pork dumplings were good but next time (whenever that will be), I’ll just OD on the xiao long bao. Dan dan la mian was a tidy little bowl of hand pulled noodles in a gently spiced sesame and peanut sauce. They were delicious and nutty. 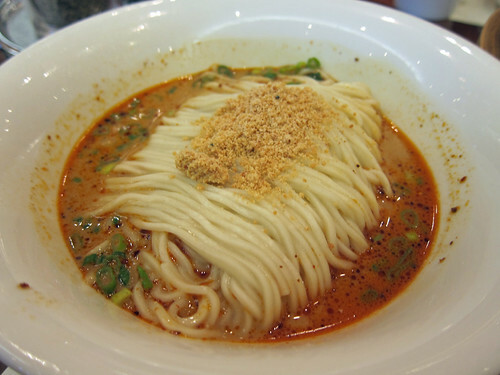 I believe this kind of dan dan mian is Taiwanese in style; the original Sichuan version is different – porkier and much spicier. I do enjoy both versions though. The price for our meal was very reasonable and if I had had more time in Hong Kong, I would have loved to go back to have more dumplings. On our way out, we stood and watched the chefs make red bean dumplings. Terribly fiddly things and I’m glad they were making them and not I! They have branches all over the world but sadly not here – do go and support Mr Noodles’ campaign to bring Din Tai Fung to London! Please, Din Tai Fung, we need you in Europe! 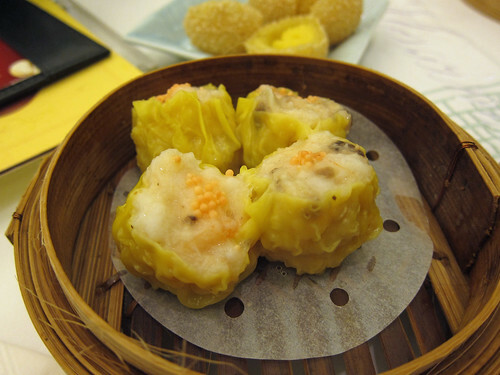 The next on the must-eat list for Hong Kong was dim sum, of course! My first dim sum lunch was at City Hall Maxim’s Palace and it started with a queue; about an hour after first getting a number, we finally got a table. It’s certainly a big and fancy place and, surprisingly to me, tea was served in the British style – silver service! And trolleys! 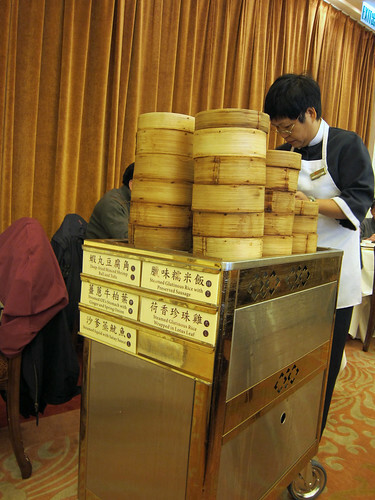 I miss trolley dim sum and to have it for the first time in years was great fun. I loved how each trolley had signs that said what each contained. 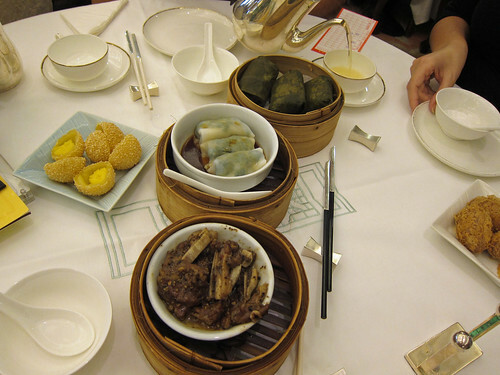 It was all very good, traditional dim sum but I believe that, in London, the dim sum at Pearl Liang or Princess Gardens matches it. It was this next place, though, that spoiled me. 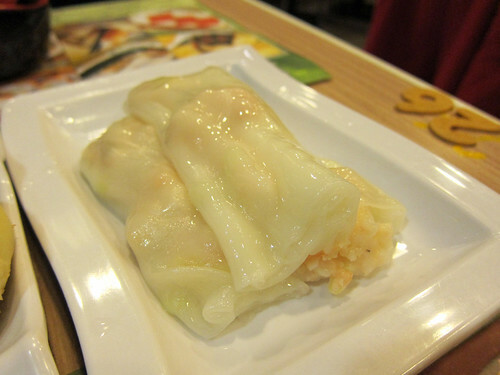 Tim Ho Wan is most famous for being a budget, hole-in-the-wall dim sum restaurant with a Michelin star in Mongkok. They’re also famous for the crazy crowds that queue for hours to get a table. It’s certainly doing well as it’s now a group (chain?) of three restaurants and it was to the newest branch at Hong Kong station (under the IFC) that we went to have breakfast. At 9-10am on a weekday, it was possible to get a table without having to queue. Steamed eggplant with soy sauce was delicious and not something I’ve seen at other dim sum lunches. 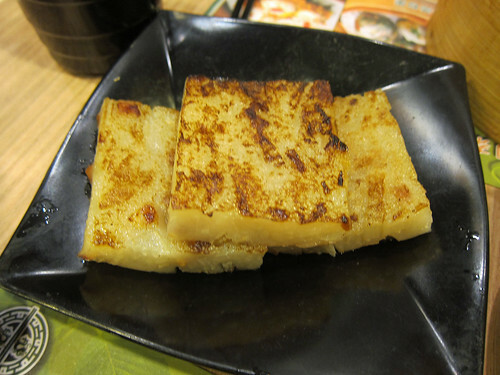 Pan fried turnip cake was a very good version with lots of thickly shredded daikon radish. 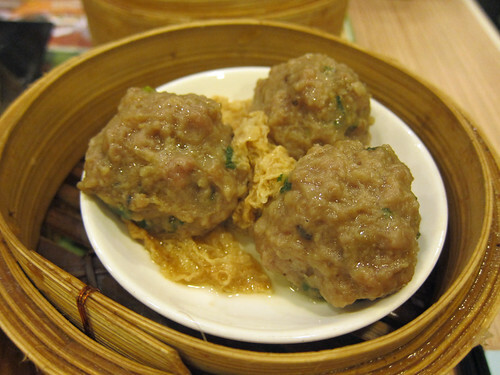 The steamed beef balls with bean curd skin were fantastic – these beef balls were meltingly tender and had a great flavour. While we were deciding what to order, the man next to us leaned over and insisted we had to order his favourite, the malai goh, a steamed egg cake (the name translates to Malay cake though…is it from Malaysia?). I’m not normally a big fan of this cake and the version we had at City Hall Maxim’s Palace was just ok. This one, however, … you can’t see it here but it was amazingly soft and wobbled gently as the steamer was placed on our table. And yes, it was delicious. 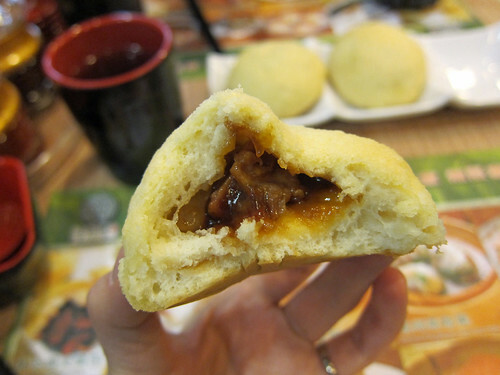 These char siu baked buns are a must order. They’re just about the best pineapple buns I’ve had – the bread was soft, the crust was intensely buttery and crumbly and the char siu filling was generous and wonderfully saucy. Such tasty tasty goodness. 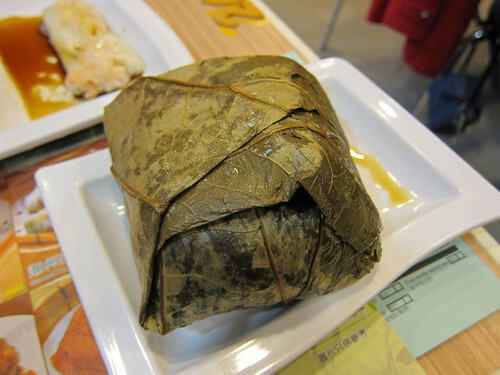 How much for this gorgeous dim sum? 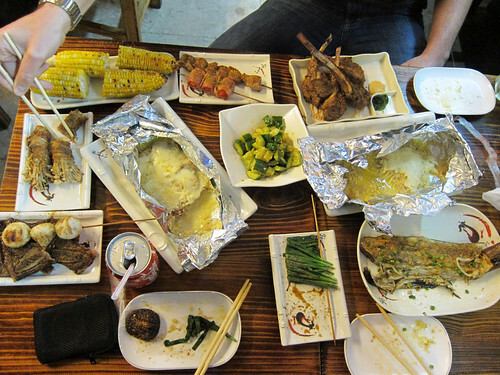 Every dish was only about 12-20 HKD, depending on size; it was a bargain. I’d originally hoped to visit three dim sum places but after my first visit here, that third place got scratched off the list to make way for another visit to Tim Ho Wan to sample more from their menu. Of course, we had to have the baked char siu buns again. Here’s the shot of their insides. 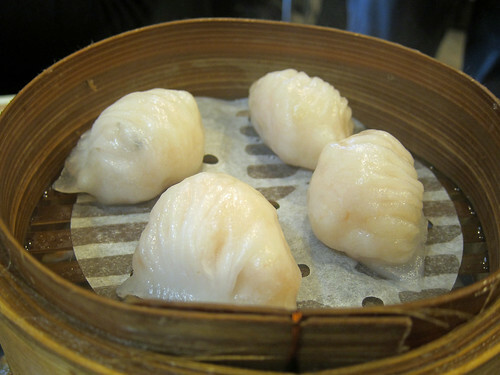 The prawn and chive cheung fun was good but nothing special compared to other dim sum restaurants. 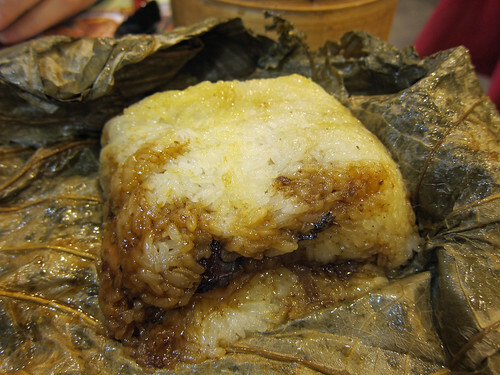 I wanted to try their “glue dumpling”, an amusing translation for what actually is a large glutinous rice dumpling. 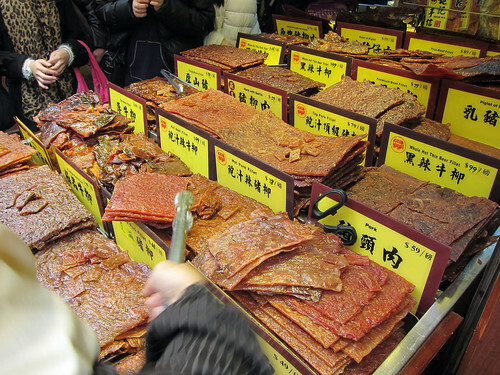 This was amazing with its myriad fillings – dried mushrooms, salted egg yolk, slices of meat. Yes, full on slices of meat. I was sad that we just couldn’t finish it – it was very big. 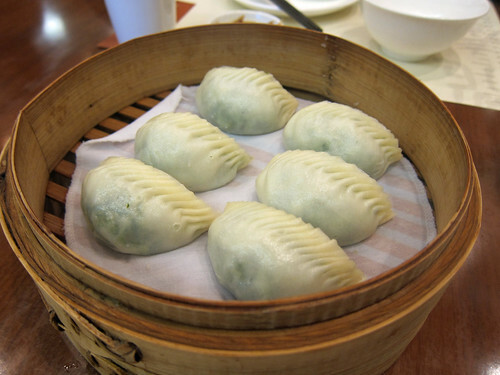 We also had to order their har gau (prawn dumplings) after seeing a group of men painstakingly pleating the little things in the kitchen on our last visit. And yes, they were excellent but again, ones of similar quality can be found elsewhere. 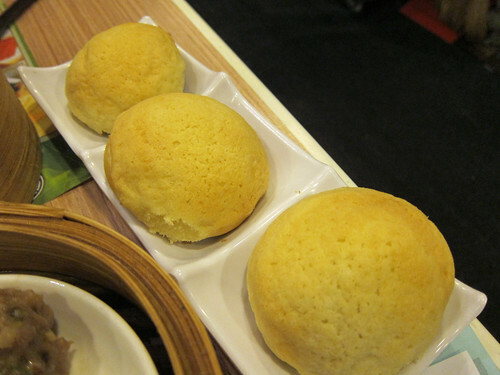 I love Tim Ho Wan. This branch at the IFC is great – it’s in no way fancy with its wipe down tables and chairs but the food! 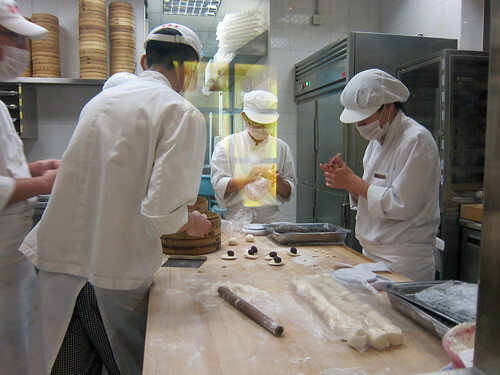 It has an open kitchen and it’s possible to see the chefs all at work, making the dim sum that will feed all those in the queue. Did I mention it’s also cheap? Yes, it’s a total bargain for the quality – I now understand its popularity. 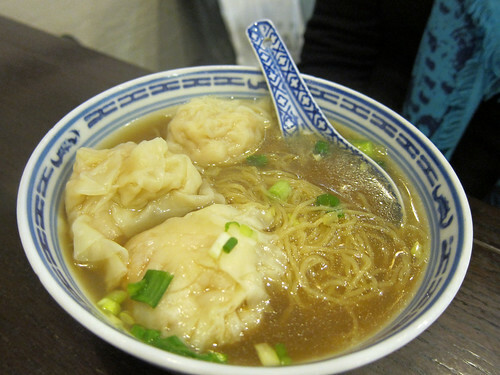 By some sheer coincidence, I reckon, two of Hong Kong’s best known wonton noodle shops are located across from each other on Wellington Street in Central. On one side, Mak’s Noodles; on the other, Tsim Chai Kee. It was late breakfast time one weekday, perhaps almost brunch, when we decided to try both of them. I hear both places fill up at lunchtime with all the financial workers in the area so it’s probably best to go either early or late. We started at Mak’s. Two bowls of wonton noodle soup were ordered (about 25HKD each) – regular egg noodles for me and flat rice noodles for M. Lots has been said already about the size of the portions at Mak’s but even after reading about it all, it was still a bit gobsmacking to have a tiny bowl served to you. You know those Chinese soup bowls that are usually set at each place at a Chinese restaurant? Yeah, that size. Four little wontons sat at the bottom of the bowl, under the little pile of noodles. The standard size for a wonton in Hong Kong seems to be of ping pong size but these were significantly smaller. Still, they were tasty with their prawn filling. 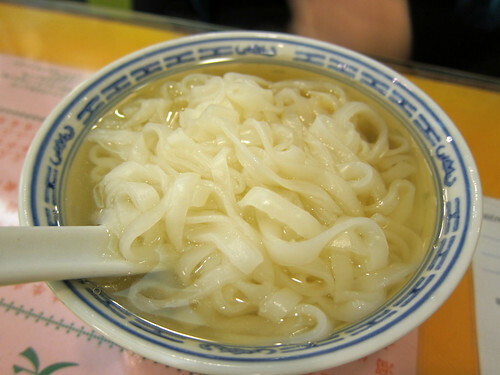 The noodles were excellent with a great bouncy texture and the soup was very flavourful. It was a great bowl but the size of the portion and the price of that portion is a bit hard to stomach. I reckon I could put away at least 3-4 bowls comfortably which definitely doesn’t make this a budget noodle shop. Of course, if this was in London, it would almost be a bargain for the quality evident in the bowl. 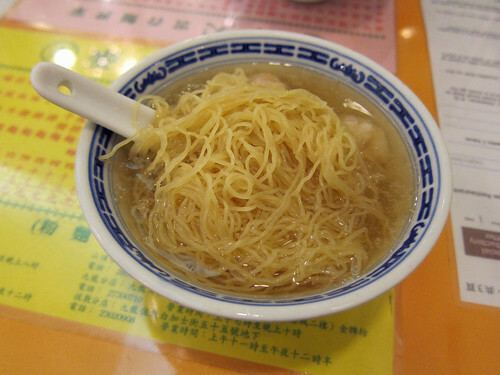 They’re also famous for their dry noodles topped with shrimp roe but we didn’t have another chance to try those. 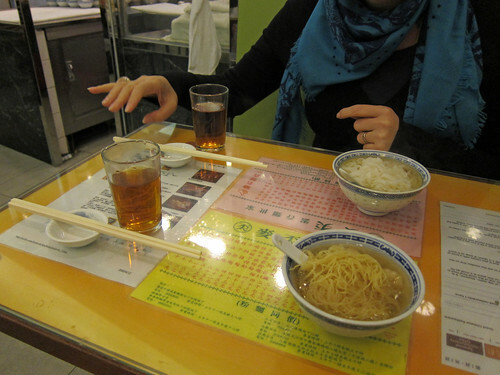 With lots of space still in our tummies, we crossed the road and entered straight into Tsim Chai Kee. The inside was surprisingly modern and all dark wood and a great contrast to the old-fashioned look of Mak’s. The menu is shorter than that of Mak’s with only 3 kinds of toppings available: wontons, sliced beef and fishballs. Prices were lower (about 20HKD for one topping and 23HKD for two toppings) and portions were bigger. M chose the wonton noodle soup this time and yes, it was a generous portion. Again, excellent noodles but I thought there was more of a lye flavour in the soup which must have leached out from the noodles. 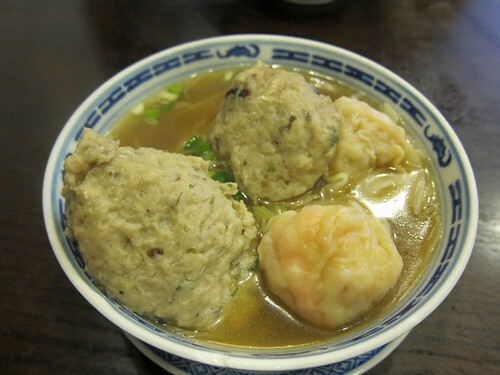 Still, I would happily down a whole bowl of these noodles with their ping pong sized wontons. I went for two toppings: wontons and fishballs. The bigger wontons made for a meatier mouthful though in hindsight, I quite like the daintiness of Mak’s wontons. 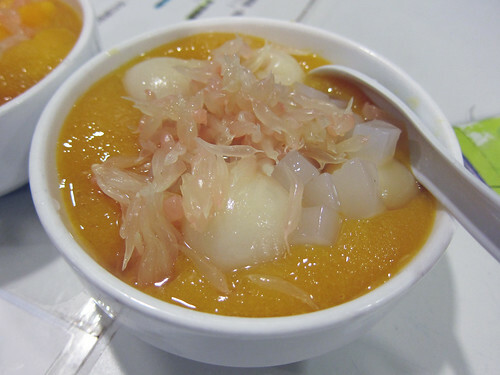 The huge, bouncy, homemade fishballs were excellent – they were made of dace and studded with dried orange peel, not something I’d had in a fishball before. The noodles were just as good as in Mak’s. Oh, I can’t pick a straight out winner. Both were great but for value for your buck (and it’s all about good value here), Tsim Chai Kee is better. When I go back one day, it’ll be all three toppings in a bowl for me (yeah, then I’ll cross the road and have a plateful of dry noodles with shrimp roe)! Just realised that almost a month has passed since I was in Hong Kong – it feels like yesterday! Anyway, happy Chinese new year! The year of the dragon started on Monday and sadly, I have had no time to celebrate due to work. I’m sure I’ll do something later. It was just past Christmas-time when I was in Hong Kong and one of my colleagues who calls Hong Kong home was back visiting friends and family; we arranged to meet up in Mongkok one afternoon. 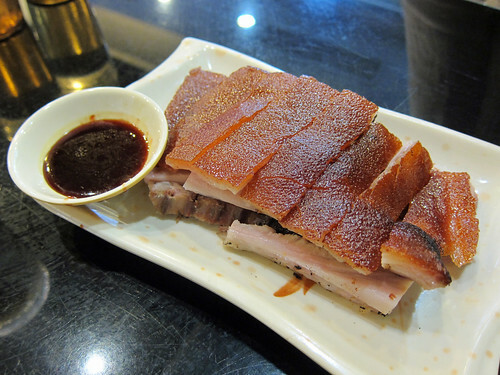 There’s nothing like being shown around by locals and they understood what I meant by wanting to try things that were particularly from Hong Kong. And yes, they too are serious about eating. Mongkok was exactly what I expected of Hong Kong: crowded and brightly lit with signs and with snack stands at every corner! After walking about the pet market for a bit (and cooing at the cute little puppies), we started with the proper eating with my first egg waffle (also known as an eggette). Oh, how beautiful it was. 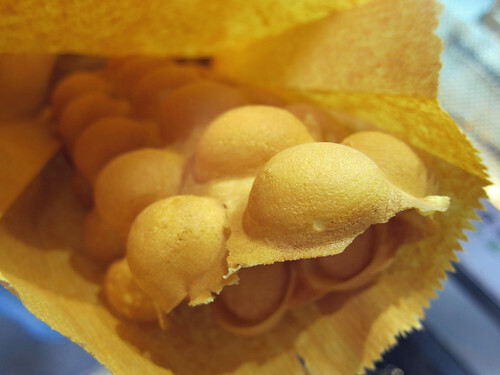 I loved the contrasts in the waffle – the light and pillowy puffs connected by a thin crisp sheet. The flavour was excellent too and no extra sauce was necessary. It amused me no end to eat them by hand, snapping off pieces as you go. We went off wandering down the Ladies’ Market but that egg waffle wasn’t enough to fortify us and we found ourselves flagging by the end of it. We were brought over to China Cafe, a little cha chaan teng, a particularly Hong Kong style of tea cafe, hidden from the street by a food market. Nothing seem to have been touched in the cafe since the 60s and had retained every bit of charm for it. Watch out though if you don’t read Chinese – they don’t seem to have an English menu. 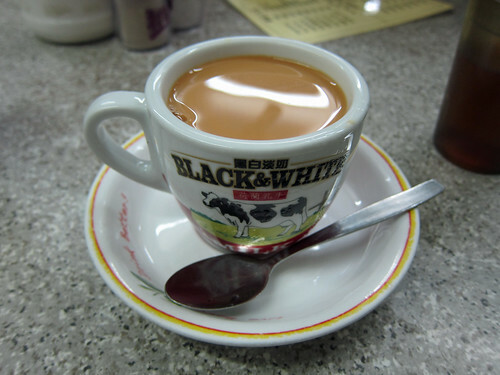 Hot milk tea was very strong and benefited from lots of sugar. 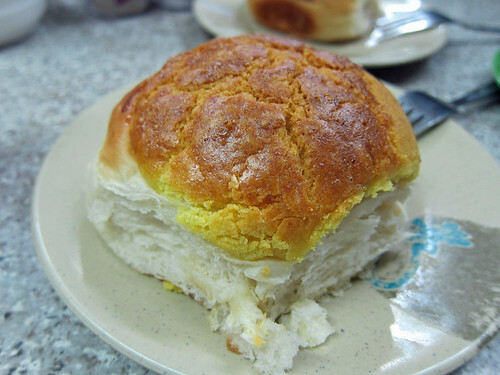 A couple of pineapple buns (bolo bau) were ordered with thick slices of butter stuffed in the middle. Ah, now I know where I was going wrong with pineapple buns – I always found them quite dull. They’re just plain buns with their only redeeming feature being the sweet cookie crust; despite their name, there’s no actual pineapple in them. Well, it’s much better with butter! 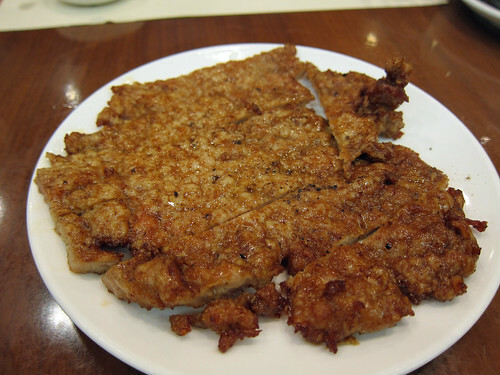 And another first for me – Hong Kong style French toast. I think they deep fry the entire thing, which is the only way I can think of for the egg to turn such a beautifully even brown. 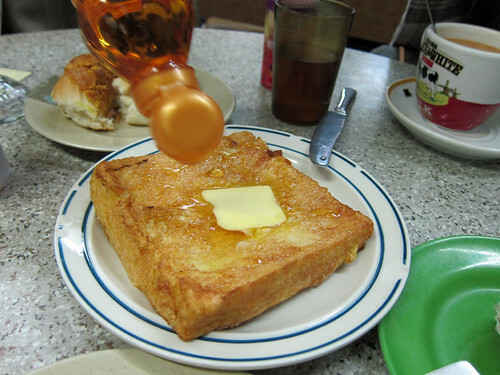 M poured syrup over the entire thing and we all tucked in – yes, I do love this kind of French toast. We wandered back past the station to see the lights of Mongkok. The sky may have been dark but down on street level, it could have been confused for day! 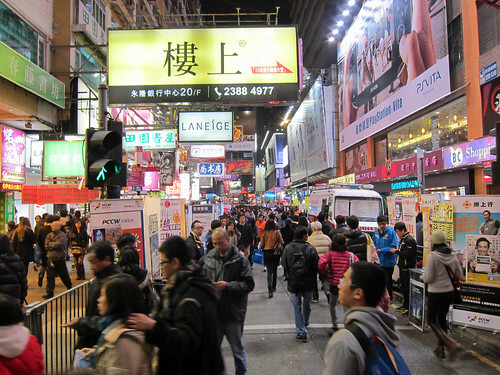 It was crowded (Mongkok has the highest population density in the world) and bright and fun. After again walking around for a bit, K and M led us to a street lined with restaurants. K wanted to introduce me to Chiu Chow cuisine. 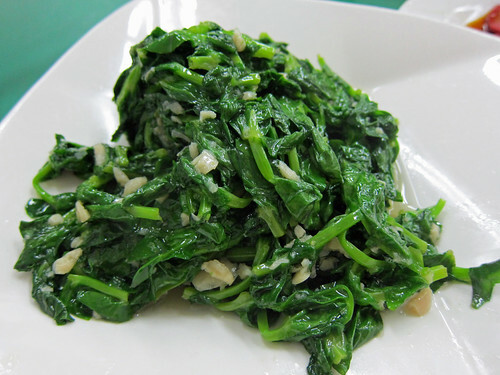 Also known as Teochew cuisine, Chiu Chow cuisine is very popular in Hong Kong and while I recognise many of the dishes on that Wikipedia page due to their popularity in Malaysia too, I had never had a purely Chiu Chow meal nor did I know what was popular in Hong Kong. (Oh, Teochew porridge I do know – I wrote about it a couple of months ago.) I was quite excited to try it with those in the know. K started us off with a peppery soup of pork intestines and pickled vegetables. 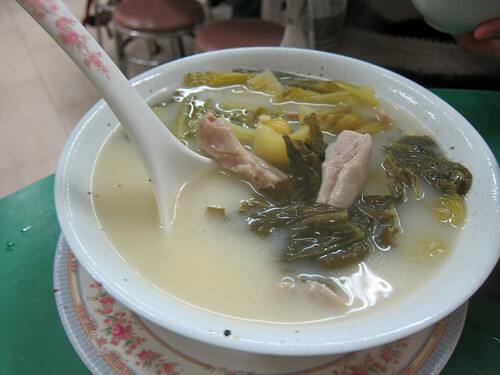 While the intestines weren’t for me, I loved the strong flavour of white pepper in the porky broth. 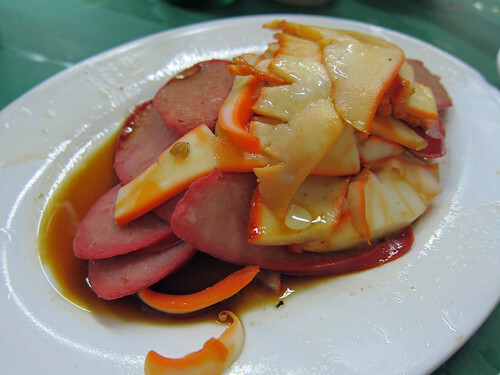 A combination of barbecued sweet sausage and squid appeared on almost every table there. 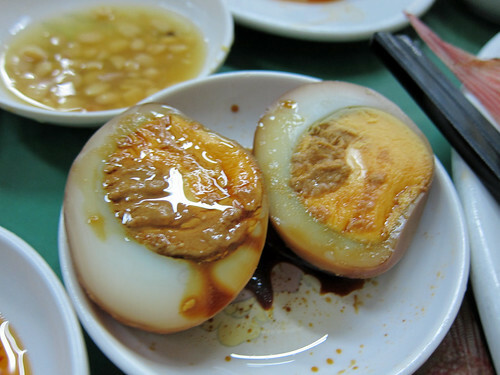 An egg braised in spiced soy too was also ordered. It’s quite plain but in a soothing way. 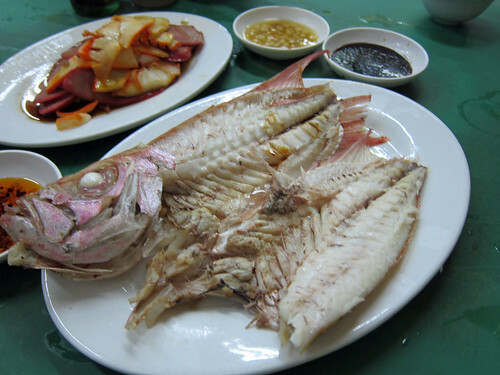 A plain grilled fish came out with a variety of sauces – soy, chilli, soy bean. Actually, I started losing track of all the sauce dishes around me. If it’s one thing that struck me about Chiu Chow cuisine, it was the use of so many condiments at the table. The Chiu Chow oyster omelette was totally different to the sticky, starchy Malaysian variety that I knew. This deep fried eggy fritter had oysters scattered throughout and was delicious dipped in chilli sauce. 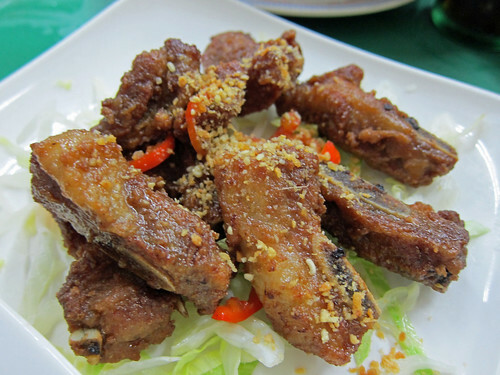 Some brilliant salt and chilli pork ribs and stir fried pea shoots with garlic rounded up our meal. Oh, and white rice too, gotta have that. We stuffed ourselves well. As always, there was still space in our dessert stomachs (though this time, we really were struggling) and K and M took us to Lucky Dessert nearby. We were there early in the night and so the place was half empty but they assured us that it gets much busier later as it’s quite popular with the younger crowd. 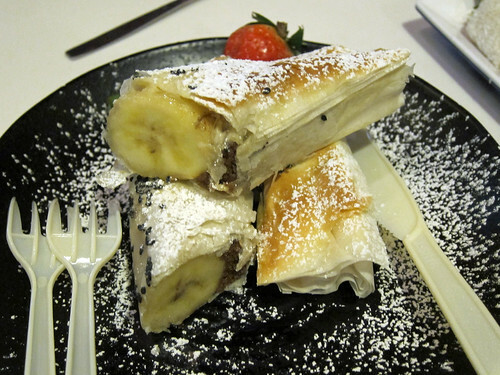 I do like the fresh and fruity Hong Kong style desserts and the ones served here were quite modern in style. 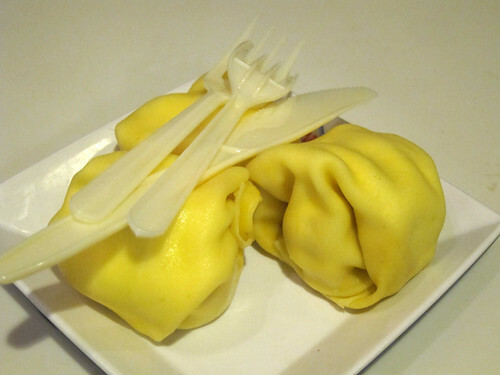 Mango pancakes were thin crepes filled with cream and slices of fresh mango. 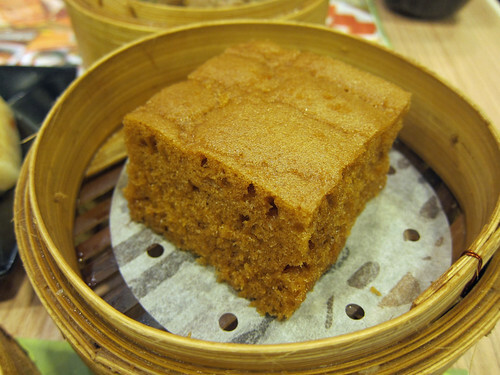 This appears to be quite a popular dessert in Hong Kong and I have to admit, I’m still on the fence about this one. I think I prefer my mango without cream. 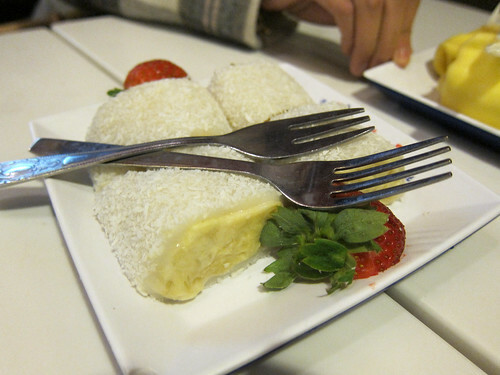 My favourite was this last one – durian in sticky rice rolls. Thin mochi-like skins were rolled around lots of fresh durian meat. I had no idea durian was so popular in Hong Kong! As you can imagine, we had to roll ourselves back home that night. Thank you so much for showing us around, K and M! 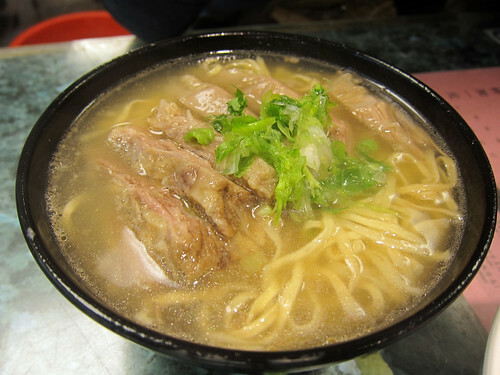 Beef noodle soup. When more than one person recommended the ones at Kau Kee to me, it became a priority visit while in Hong Kong. 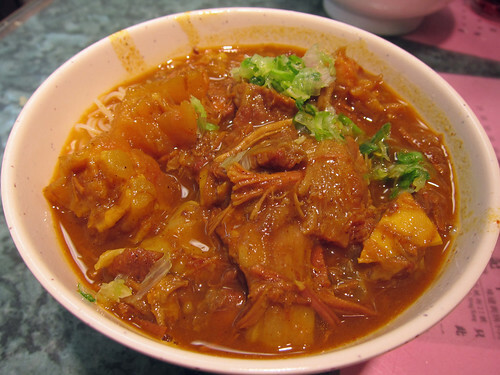 As befits a 90+ year old restaurant with a speciality, their menu is short – beef brisket or beef slices or curry beef tendon on your choice of noodle soup. There may have been a vegetable too. At about 8pm on a weekday, three of us found a table with relative ease though the small restaurant was constantly packed while we were there. A bowl of Kau Kee’s special beef brisket in traditional broth (88 HKD, all beef and no noodles), another of beef brisket with e-fu noodles in broth (32 HKD), and two curry beef tendon with rice vermicelli (30 HKD each) had us bursting at the seams. 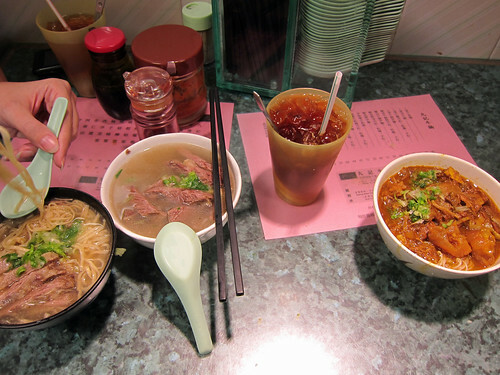 The bowls weren’t large but they were filled to the brim – lots of noodles and beef and topped up with broth. 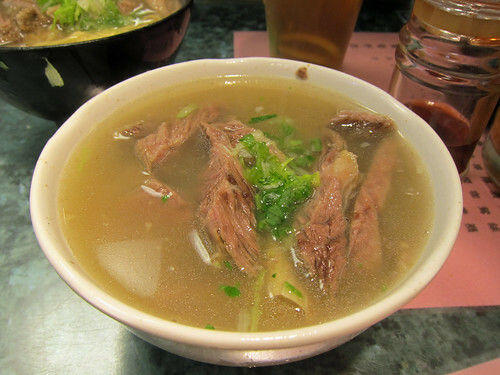 The beef brisket was just tender and very flavourful and well, beefy, as was the broth. I enjoyed the e-fu noodles though perhaps their strong flavour would pair better with the curry. The curry beef tendon was gorgeous. This beautiful bowl opened my eyes to excellent Chinese curries – I had only had terrible yellow curry powder and cornstarch monstrosities prior to this. This was delicious and rich and complex and full of both tendon and beef brisket. 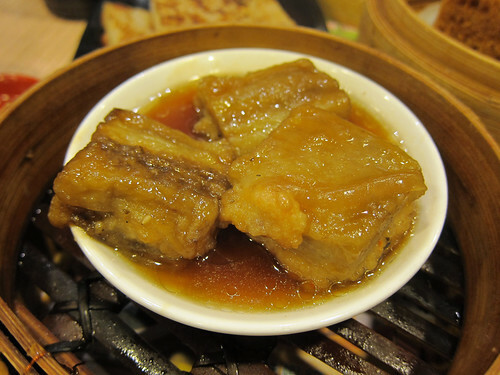 I’d never had such soft beef tendon as this before; they must have simmered the mixture for ages. We did over order by that bowl of extra beef; a single bowl of beef and noodles each would have been enough and been even more of a budget dinner. Oh, what I’d give for a bowl of the curry right now!